Looking for Lecturers / Librarian jobs in Engineering Colleges 2018 in Orissa? or Searching for Faculty Plus Teachers Orissa 2018 or Faculty ON Odisha? 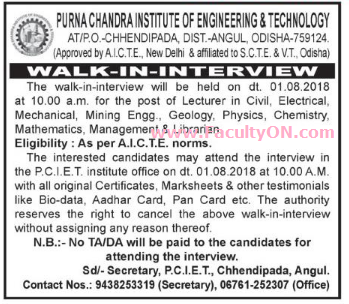 A College based in Purna Chandra Institute of Engineering & Technology, Angul has advertised in the SAMBAD newspaper for recruitment of Lecturers / Librarian jobs vacancies. Interested and eligible job aspirants are requested to walk-in on 01st August 2018. Check out further more details below. About College: The Purna Chandra Institute of Engineering & Technology(PCIET) Chhendipada, Angul is a reputed self-financing technical institution of the state established in the year 2009 by P.C.I.E.T trust duely registered by the Govt. of Odisha under Indian Trust Act, 1882 with a aims at promoting excellence and innovation in technical education and development of advance technology skill relevant to the country and the region. The institute is approved by A.I.C.T.E. from the academic session 2009-10 is recognized by Govt. of Odisha and affiliated to S.C.T.E V.T, Orissa. How to Apply: Interested and eligible candidates are requested to attend the interview in the PCIET institute office on 1st August 2018 at 10.00 am with original certificates, Mark-sheets and other testimonials like Bio data, Aadhar card, PAN card etc. to the walk-in address mentioned below.